“We live the given life, and not the planned.” That line etched itself into my mind the moment I first read it. Simple and profound, an antidote to the disorders of our time. It would make a great difference, would it not, if our posture toward life were such that we received it as a gift with gratitude and wonder; if our hands were open to receive and to give in turn rather than clutched to take and to keep? I tend to think it would make all the difference. This is a lovely post for today. Thank you. Your post is a wonderful read. Would like to add some comments, though. It’s necessary to be grateful for small mercies, and for our daily bread, and life itself, but a large part of what you term as “disorders of our time”, may be because we expect others to be grateful to us for the good that we may have done to them. Would you conclude that one should be grateful and express thanks for life and whatever life has to offer,in general, for our own happiness, and thereby the happiness of others around us ? You had written on Kurt Vonnegut earlier, which was relished by Vonnegut fans across the spectrum. In one of his books, there is a story by Kilgore Trout, about people who expected a grateful thanks from others to whom they had done favors, and those who refused to be grateful,that is, say a simple thank you, would undergo a jail term. As the story goes, 80 percent would refuse to say the thanks, and agree for the jail sentence! Many thanks. What I had in mind reading Berry and Chesterton together was largely a certain posture toward life and toward others, a posture of receptivity if you will, but also one that is prepared to give as well. It is interesting that you mention the expectations of the gift giver since I recently read a few reflections on that topic from a few philosophers/anthropologists/critics who paid a good deal of attention to “the gift” — Mauss, Bataille, Derrida, Milbank, among others. Motive and expectations are important, and I would think that if in giving one gives only to receive, then, yes, that is setting oneself up for a good deal of disappointment and to some degree brings the status of the gift as gift into question. I’m not sure, however, that I would rank that very high among our disorders, although it can certainly be a problem. What I most appreciate about Berry’s reading of this scene in King Lear is the sense that the greatest gift we might offer the other is their own self or subjectivity. “We live the given life, not the planned” could be taken to mean that we live a life that is just there, one we are thrown into and that is not subject to our manipulations. But that line in the context of the whole poem and the scene in Lear can also be taken to mean that we live the given life in the sense that our very life and self-consciousness is a gift we receive from others in that it is the presence of an other that elicits from me my awareness of myself possible only in relationship with an other. The son’s gift to Gloucester is nothing less than Gloucester’s own life. Thanks again for the comment/question, I hope I was at least in the ballpark with this response. Is that what Chesterton looked like? He was obviously not at all sensitive to the state of his body and its inherent urge to be in a state of balanced equanimity. He was obviously over weight and a drug (tobacco) addict. Which is to say that over a life-time he was systematically destroying his body. I wonder if he would have felt “the feather of the breath of God” Hildegard of Bingen. My goodness! 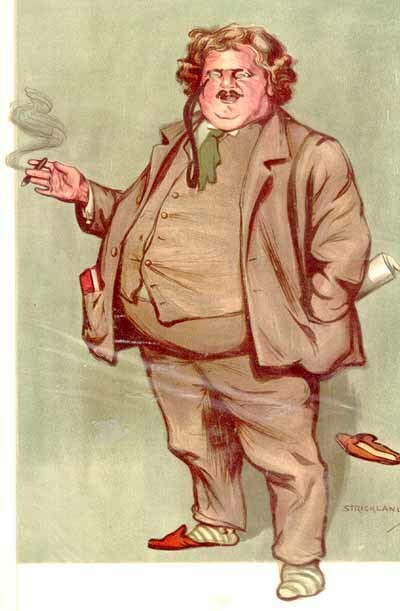 Chesterton; a man of his spiritual stature, extravagant gifts, exuberant love and enduring wisdom and influence chastised for smoking and for not having a beach body!